U.S. President Donald Trump’s administration has ushered in a new era of skepticism toward all immigration, legal as well as illegal, the likes of which has not been seen in recent U.S. history. While Trump’s campaign rallying cry for a physical wall along the U.S.-Mexico border has yet to come to fruition, his administration’s actions in 2017 have amounted to the slow and steady construction of bureaucratic barriers reducing opportunities for foreigners—including highly skilled workers—to come to the United States. (For more on the Trump administration’s inward-facing immigration policies, see Issue #4: Trump Administration Makes Down Payment on Campaign Pledges to Address Illegal Immigration). In a sharp reversal of the welcoming attitude of previous presidents of both political parties toward legal immigrants, the Trump administration has cast immigrants as threats to the national and economic security of U.S.-born workers. And the President has taken steps accordingly. Some have been symbolic, such as ordering data collection and reporting of crimes committed by immigrants and the cost of the refugee resettlement program—designed to showcase the negative aspects of immigration. Other actions have been concrete, such as banning travelers from certain countries, cutting the refugee resettlement ceiling, and increasing screening for visa applicants. First signed just one week after Trump took office in January, the travel ban executive order has been the highest-profile example of the administration imposing new limits on legal immigration. This order suspended the entry of nationals from seven majority-Muslim countries and paused refugee resettlement for 120 days, arguing national security concerns necessitated immediate action. 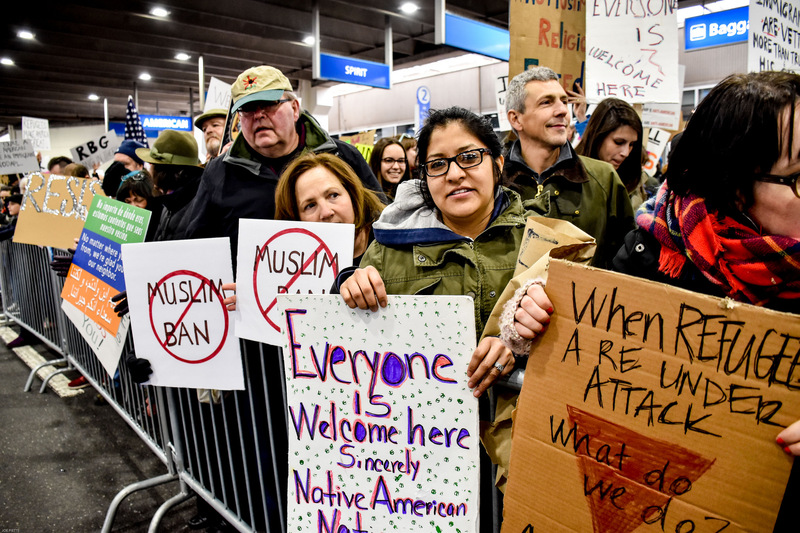 The ban’s sudden implementation caused dramatic scenes at U.S. airports, as travelers were turned away on entry and crowds of protesters and lawyers gathered to support those caught up in the ban. Legal challenges soon followed, and courts blocked or stalled much of the first travel ban, as well as the second version, issued via executive order in March. Now in its third iteration, the travel ban seeks to block certain nationals of Chad, Iran, Libya, North Korea, Somalia, Syria, and Yemen, as well as government officials from Venezuela, from obtaining new visas. This ban is currently in place, even as it continues to be challenged in court. Given the suspension of refugee resettlement under the first and second versions of the executive order, and the establishment of a lowered 50,000 resettlement cap, refugee admissions fell far below their original target for fiscal year (FY) 2017: Just 53,716 refugees were admitted, though President Barack Obama had set the cap at 110,000. Refugee admissions formally restarted in October, under a new executive order, with “extreme vetting” measures in place. However, this executive order also established a 90-day period during which the government would consider additional screening for refugees from 11 countries, which together accounted for roughly 43 percent of refugee admissions in FY 2017. In the first five weeks of the 90-day period, just 15 refugees from those countries were admitted. The administration also set the FY 2018 refugee ceiling at 45,000, the lowest since the program was formally created in 1980. The administration also ended the small, but symbolically significant Central American Minors (CAM) Refugee and Parole Program. Through CAM, lawfully present parents of children from El Salvador, Guatemala, and Honduras could apply for refugee status for their children abroad, so that children could make protection claims without first hazarding the dangerous journey to the United States. From the launch of CAM in 2014 to its termination, several thousand children and eligible family members received refugee status or were granted parole and entry to the United States. Refugees and nationals of certain countries are not the only ones facing new barriers to entry. Another executive order, entitled “Buy American, Hire American,” requires extra scrutiny of temporary foreign workers, including a review of the high-skilled H-1B program. Immigration lawyers have accused the administration of using tighter scrutiny of applications to effectively slow these immigration streams. For example, H-1B applications in 2017 received 44 percent more requests for additional evidence compared to those in 2016, holding up processing. H-1B denials were also up: Nearly 18 percent of applications were denied in November 2017 compared to roughly 8 percent the same month a year earlier. Further, under a policy issued in October, H-1B renewals will receive the same level of scrutiny as initial applications. Previously, those extending their period of work while remaining in the same job were not subject to a thorough review during renewal. It remains to be seen how this increased scrutiny will affect overall 2018 H-1B applications; these numbers were already down in spring 2017. The Trump administration is also weighing additional changes to H-1B visa requirements, including redefining the “specialty” occupations that qualify for a visa, and reworking the meaning of “employment” and “employer-employee relationship.” Further, under legal pressure, it has signaled it will rescind a 2015 rule allowing spouses of H-1B holders to obtain work authorization. Currently, the husband or wife of an H-1B holder can apply for a work permit if the visa holder has worked for at least six years on the visa and is awaiting a green card. If such a move goes forward, it will render the H-1B visa less desirable for dual-career couples. Meanwhile, the administration is quietly implementing policies scrutinizing legal immigration, in the form of administrative hurdles that could further slow application processing or deter would-be applicants altogether. U.S. Citizenship and Immigration Services (USCIS) expanded the in-person interview requirement for certain green-card applicants for whom it previously may have been waived, mainly affecting those adjusting status from a temporary work visa to an employment-based visa within the United States. In addition, USCIS increased the number of questions visa applicants must answer, possibly spurring greater need for legal assistance in completing already complicated forms. This heightened scrutiny also extends to the digital realm: In September the Department of Homeland Security (DHS) announced it would soon begin collecting the social media handles of all immigrants, including green-card holders and naturalized citizens, for government monitoring. A few early signs indicate foreigners may be less interested in visiting or moving to the United States. Travel to the United States was down 4 percent in early 2017 compared to early 2016. New international student enrollment fell by an average of 7 percent in fall 2017 compared to the previous year, in a snapshot survey of about 500 colleges and universities. Seizing an opportunity, the Canadian government has encouraged U.S. tech companies to move to Canada, where they might have better access to skilled foreign workers. During its first year, the administration has taken broad steps that could result in slowed legal immigration to the United States, including by reducing refugee levels and increasing screening of would-be immigrants. But plans to further narrow immigration streams may face constraints in practice. Most substantive reforms to temporary worker programs require action by Congress, which overall is far less skeptical of the value of high-skilled immigration than some in the administration. Cutting annual green-card issuances in half, or eliminating the Diversity Visa program, would likewise require Congress to act—which remains unlikely, given that Congress last had the appetite to revise the green-card system in 1990. Further, ongoing attempts to pause or block immigration from designated countries will face continued legal opposition, leaving policymaking on this issue in the hands of the courts. Nevertheless, the administration’s moves have broadcast a clear message: The United States is slowly closing its doors to some of the world’s immigrants. Even if the actions of 2017 represent the full sum of the administration’s moves on legal immigration rather than a down payment, they signal to would-be immigrants that the government may be more likely to fear them as potential threats than welcome them as new Americans. Time will tell whether immigrants will respond in kind and turn away from the United States as well. Anderson, Nick. 2017. Report Finds Fewer New International Students on U.S. College Campuses. Washington Post, November 13, 2017. Available online. Anspach, Rachel. Unimaginable Cruelty. Slate, October 9, 2017. Available online. Bier, David. 2017. The Trump Administration’s Stealth Attack on Legal Immigration. Washington Post, August 28, 2017. Available online. Brustein, Joshua. 2017. H-1B Applications Drop as U.S. Employers Anticipate Reforms. Bloomberg News, April 17, 2017. Available online. ---. 2017. Trump's H-1B Reform Is to Make Life Hell for Immigrants and Companies. Bloomberg Technology, November 6, 2017. Available online. Calamur, Krishnadev. 2017. Trump’s New Refugee Policy Targets These 11 Countries. The Atlantic, October 25, 2017. Available online. Donnelly, Grace. 2017. Foreign Travel to the U.S. Dropped and It Left A $2.7 Billion Hole in Consumer Spending. Fortune, September 22, 2017. Available online. Hesson, Ted. 2017. Trump Targets 11 Nations in Refugee Order. Politico, October 24, 2017. Available online. Miller, Zeke and Jill Colvin. 2017. White House to Push Merit-Based Immigration in New Campaign. 2017. The Washington Post, December 14, 2017. Available online. Nixon, Ron. 2017. U.S. to Collect Social Media Data on All Immigrants Entering Country. The New York Times, September 28, 2017. Available online. Thadani, Trisha. 2017. Trump Administration Has Plans to Wipe Out Work Permits for H-1B Spouses. San Francisco Chronicle, November 17, 2017. Available online. Torbati, Yeganeh. 2017. Trump Lifts Refugee Ban, but Admissions Still Plummet, Data Shows. Reuters, December 8, 2017. Available online. U.S. Citizenship and Immigration Services (USCIS). 2017. USCIS to Expand In-Person Interview Requirements for Certain Permanent Residency Applicants. News release, August 28, 2017. Available online.